I buy very few souvenirs when travelling. 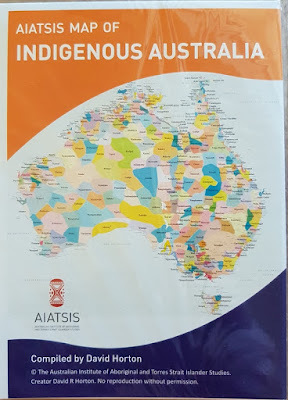 When I was at The Museum and Art Gallery of the Northern Territory earlier in the year I saw a map, The AIATSIS Map of Indigenous Australia, that fascinated me so I parted with $9.95 to buy a copy. "The map attempts to represent all the language, social or nation groups of the Indigenous peoples of Australia." AIATSIS Website and there I discovered that the map is available online free for all to see. The online map has a 'magnifying glass' circle that you can move around to highlight selected areas. While I prefer my larger hard copy map the price is right for the online version. Take a look to determine who were the language, social or nation groups of the Indigenous peoples in the areas where your ancestors lived.